Guanciale is one of my favorite ingredients. Guanciale is the cured jowl of a pig, and though it is from the head and not the belly, its fat/meat profile is very much like bacon. Like bacon it has an exquisite richness, but unlike bacon is it usually not smoked (though it can be). In Italy, one associates guanciale especially with Rome and the trio of pasta sauces that depend upon it. Spaghetti with guanciale is gricia. Add some tomato and one has amatriciana. Add egg yolks instead of tomatoes and one has the famous carbonara in its true Roman form. Pecorino Romano and plenty of black pepper are essential ingredients of all three sauces as well. La Quercia and Rooster St. Provisions. Both do mail order. In addition to bringing home the jowl, I also brought home some guanciale from Rooster Street to tide us over the few weeks until our own guanciale is ready. 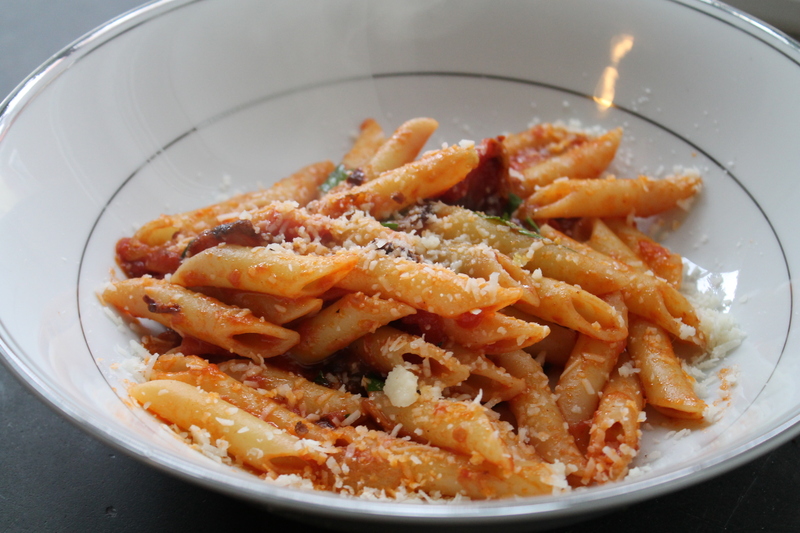 Enjoy the recipes below for spaghetti alla gricia and penne all’ amatriciana. 1) Salt four quarts boiling water with 2 tablespoons salt and add 120 grams imported spaghetti. 2) While the pasta is cooking, very coarsely chop about 50 grams guanciale and sauté lightly in plenty of highest quality extra virgin olive oil. When the guanciale is lightly browned but not yet crisp, remove from heat. 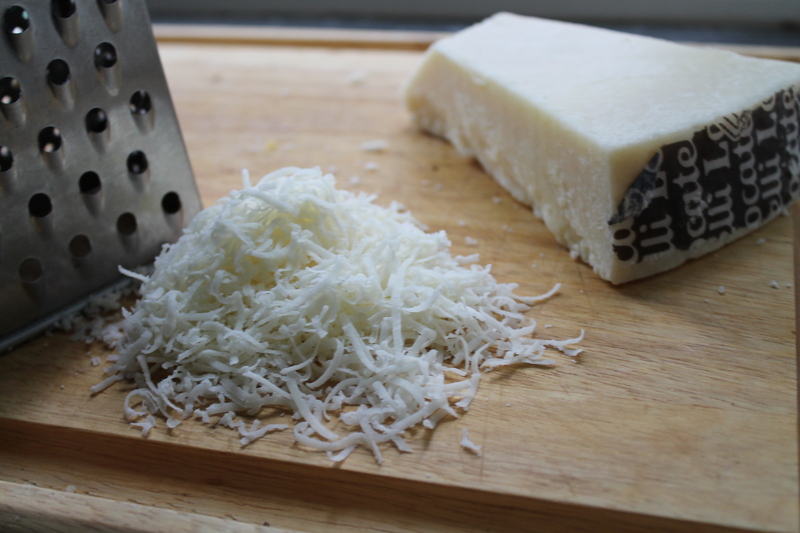 3) Grate about 1/4 cup or so imported pecorino Romano. 4) When the pasta is ready, drain it and add to the pan with the guanciale. Return the pan to heat, and toss well, adding about half the cheese, generous grindings of pepper, and a little of the starchy pasta cooking water. Depending how much cheese you use and how salty the guanciale is, you might need a touch of salt. 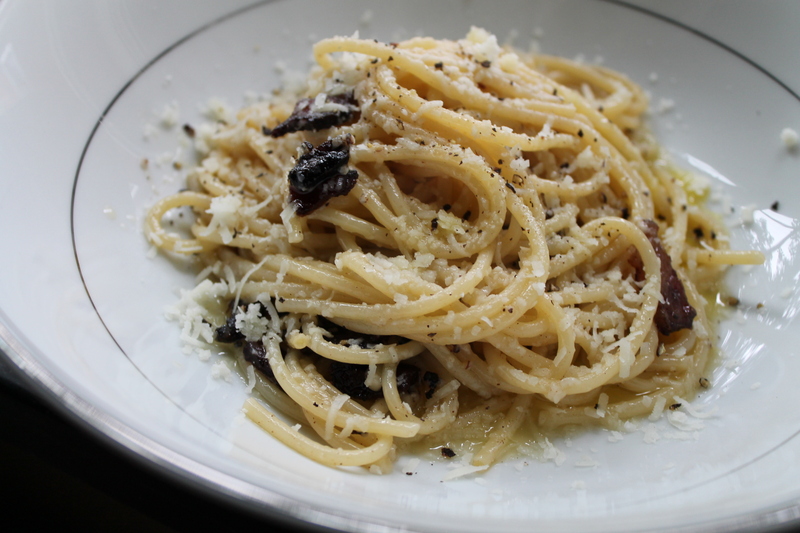 5) Plate the pasta and garnish with additional pecorino, pepper, and olive oil. 1) Follow the recipe above, adding a little chopped onion to the pan along with the guanciale. 2) When the guanciale is lightly colored and the onion has taken on a little color, add about 3/4 cup high quality canned tomatoes (or fresh in season), a generous pinch of salt, and either black or hot pepper. 3) Cook until the tomatoes are nicely broken down and lost most of their water, about 5 or 10 minutes. 4) When the pasta is ready, add it to the sauce and toss thoroughly, adding a little pecorino. 5) Plate and serve, with a little additional pecorino for garnish. Hi! Thanks for these recipes. 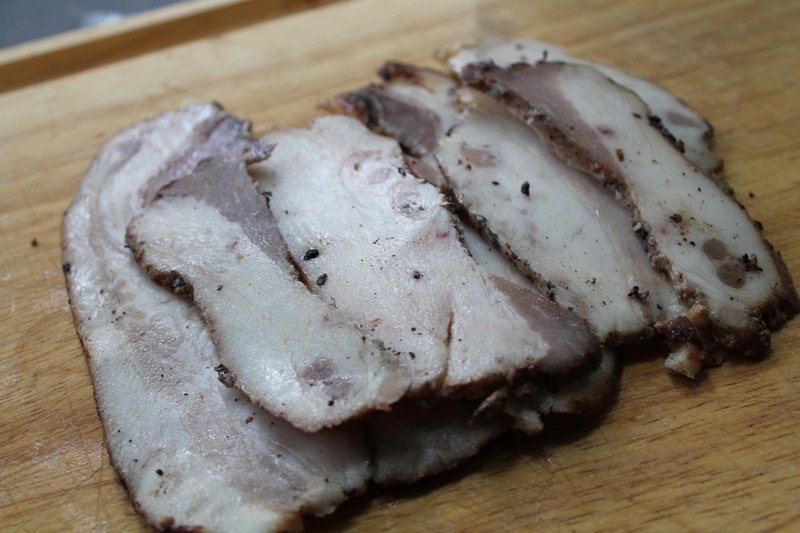 Do you find that guanciale keeps well in the freezer? If not, how long does it keep in the fridge? Hope you enjoy them! Guanciale is awesome. It does keep well in the freezer. I’ve kept it for several months without issues. Because the guanciale is mostly fat, it even slices well when frozen, so I just cut off what I need and keep the rest frozen. In the fridge, I’m sure a few weeks is fine. It is a cured meat after all. Probably a few months would be fine too, but I can’t seem to keep it around that long. I would just think of it like bacon, more or less.